Internationally acclaimed Chinese soprano for hire. Wei Li leads a troupe of gifted Chinese musicians and dancers, performing classical and folk music on traditional instruments. Internationally acclaimed Chinese soprano Wei Li leads a troupe of gifted Chinese musicians and dancers performing on traditional instruments such as the erhu, pipa, yangquin and guzheng. Far Eastern Arts brings together leading artists from mainland China, Taiwan, Hong Kong and South East Asia, creating the Wei Li Chinese Orchestra, one of the most dynamic Chinese professional art groups in Europe. Over several years they have presented a hugely successful series of concerts around Britain, including sell-out performances at the South Bank. Led by the internationally acclaimed Chinese soprano Wei Li, the company aim to share and celebrate the richness of Chinese culture with the audience. Wei Li is a member of the Chinese Musicians Association, a life executive of the Bell Canto Association and lead solo soprano of Guangdong Musical Company. She has won many distinguished awards in China and abroad, among them: Best Soprano at the South China Opera Competition, and for 3 years between 1992 and 1994, represented China in the Asian Art Festival, winning the Best Soprano prize. 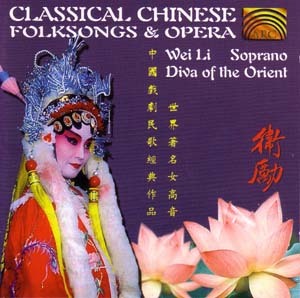 Wei Li now resides in London and lectures at London University in music, opera and drama. In 1997 she was invited by the Swiss National Radio Station to give a joint concert with Xu Pingxin and Miao Xiaoyun, and was hailed as the best Chinese soprano. Far Eastern Arts will bring you the richness and excitement of Chinese opera, music and dance, featuring the beauty of Chinese opera and folk songs, expressions of traditional dance, music and amazing acrobatics and dramatic lion dancers. Featuring the extraordinary voice of Wei Li and the wonders of Chinese traditional music on pipa (Chinese lute), guzheng (Chinese zither), yangqin (Chinese dulcimer) and zhu di (flute).